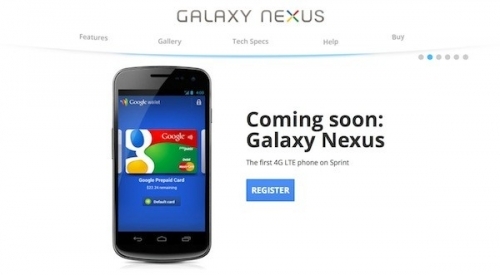 Sprint Galaxy Nexus sign up page added to Google site | Android Blast! At the CES conference this month, Sprint announced that their version of the Galaxy Nexus with LTE would be launching, but no official word was giving. It looks like the launch date could be coming soon because a new registration page for the Sprint Galaxy Nexus has popped up on the official Nexus site. Pre-registration pages usually means the device's release is just around the corner. It's interesting that the Sprint Galaxy Nexus will support LTE, even though Sprint's network doesn't provide LTE yet. Users will have to wait until later this year to take advantage of the speed bump that LTE will provide.